Italy is one of the most popular European destinations for Americans. On a first trip, most visitors hit the “Big Three” cities: Rome, Florence, and Venice. On subsequent visits, many travelers explore Tuscany’s hill towns, the five villages of Cinque Terre, or the Amalfi Coast’s seaside communities. However, just east of Tuscany lies Umbria, the “Green Heart of Italy.” Its medieval towns and rolling green hills draw visitors looking for an off-the-beaten path experience, and this hidden gem is less expensive and less touristy than Italy’s more well-known regions. Umbria has been described as Tuscany without the crowds. While it’s true that accommodations in Umbria are generally less expensive than those in its more-visited counterpart, Umbria is more than just Tuscany Two. Meandering through its 20-odd major towns (and more than 60 smaller villages) is a different experience than visiting the Tuscan towns of Siena, Lucca, or San Gimignano. Umbria’s towns aren’t clogged with tourists and tour buses, allowing for uncrowded visits to museums, and peaceful streets to explore. Each of Umbria’s medieval villages has something unique to offer, from traditional Umbrian cuisine and wine to Etruscan artifacts and famous frescos. Some of Umbria’s towns have famous churches and museums, while other towns’ main attractions are activities: wandering hilly backstreets, snapping photos, and stopping for cappuccino or gelato. Here are six of the best places to visit. Assisi is the most (and only, really) touristy town in Umbria, as it is often on Florence-to-Rome itineraries. And, as the home of St. Francis, it’s also an important destination for religious pilgrims. Despite the busloads of tour groups that clog the city during most days, Assisi is considered essential for many visitors to Umbria. To get beyond the crowds and souvenir shops selling St. Francis figurines, spend a night in town. You can enjoy an early-morning cappuccino before the tourists arrive and then take an evening stroll around town after they’ve left. The primary religious attraction is the Basilica of St. Francis, with the crypt of St. Francis and important frescos by Giotto. Assisi’s major event is May’s weeklong “Ides of May” festival known as the Calendimaggio di Assisi (in Italian only) featuring Renaissance and medieval costumes, parades, theater and dance performances, and concerts, as well as archery competitions and a singing contest. Perugia is one of the few true cities in Umbria, a bustling college town famous for its Perugino chocolate and several annual festivals. Perugia is home to two universities, the University of Perugia and the University for Foreigners Perugia (where foreign students study Italian and learn about the culture). Narrow, twisty roads lead up to the heart of the city, the Corso Vannucci, where Perugians take their nightly passeggiata (or stroll). The city’s major museum is the National Gallery of Umbrian Art (Galleria Nazionale Dell’Umbria), which is considered one of Italy’s best museums for Renaissance art. It features works by Fra Angelico, Gentile da Fabriano, and Piero della Francesca, and is currently featuring a Perugino exhibit. Another popular attraction is the Rocca Paolina, the underground remnants of a fortress. Visitors can wander around the ruins and check out an ancient Etruscan gate. The Rocca Paolina also has a public exhibition space where concerts are sometimes held. The 10-day Umbria Jazz Festival draws musicians and music lovers from around the world to Perugia every July. It features daily jazz and gospel performances, free outdoor concerts, parades, food, and wine. Chocolate lovers flock to Perugia in October for the annual Eurochocolate festival. The nine-day event centers on chocolate with tastings, carving competitions, and cooking classes. Weekends are thick with crowds, so going to the festival midweek will make for a calmer experience. Located in southern Umbria, Orvieto is a favorite town for many travelers, and is famous for its white wines. From this hilltop city, visitors can take in the views of the small towns, valleys, and vineyards below. Besides its notable wines, great restaurants, and wide array of small shops selling ceramics, handicrafts, and locally produced foods, Orvieto also has a few important attractions. Orvieto’s duomo (or cathedral), located in the heart of the city, has one of the most elaborate Gothic-style facades in Italy, and houses the Italian painter Signorelli’s famous cycle of frescos depicting the Last Judgment and Fra Angelico’s Chapel of San Brizio. Across the piazza from the duomo, the Musei Faina e Civico features a collection filled with Etruscan coins and pottery. For more Etruscan history, head to Orvieto’s underground Etruscan well and caves, known in Italian as Pozzo della Cava. For €3 (see xe.com for current exchange rates), visitors can peer down an ancient 118-foot deep well and tour a network of caves housing Etruscan artifacts. In October, Orvieto hosts the eight-day Orvieto con Gusto (Orvieto with taste) festival dedicated to food and wine made in Italy. In the winter, a smaller version of the Umbria Jazz Festival moves to Orvieto, and the five days surrounding New Year’s are filled with music, food, and events in the city. Its hilltop perch and panoramic views of the valleys and rivers below lend Montefalco its nickname, “The Balcony of Umbria.” Popular with wine lovers, Montefalco’s most famous wine is the DOCG Sagrantino, though it also produces other reds and whites. Montefalco’s wineries are not as accessible to tourists as, for example, its counterparts in California’s Napa Valley, but it is possible for tourists to arrange visits throughout the year. The last weekend in May is designated “Cantine Aperte” when wineries open their doors for wine tastings, food, and music. On Sundays from May through October, many wineries welcome visitors, and professional guides from the Strada del Sagrantino (Sagrantino Wine Road) offer bus tours of wineries with tours and tastings. Wine-related events also take place throughout the warmer months. June brings Settimana Enologica, a ten-day event celebrating wine, while grape harvest celebrations take place at the end of September. Olive oil is also produced in Montefalco, and guided tours of olive oil mills can be arranged in conjunction with wine tours. Montefalco’s olive oils are celebrated during Frantoi Aperte in November, when oil mills open their doors for public tastings. Montefalco is also home to some important works of art. The 14th-century church of San Francesco is the most notable, with frescos by Benozzo Gozzoli and Perugino. One of Umbria’s oldest towns, Gubbio is quintessential Umbria with hilly streets and ancient art, but it is particularly notable for several unique attractions and events. The Municipal Museum, located in Consul Palace, is one of Gubbio’s most important attractions, and is home to the Eugubine Tablets, ancient slabs with Umbrian inscriptions. Gubbio hosts several important annual events. The most important is the Ceri Race on May 15, when three teams run through Gubbio’s streets carrying heavy wooden statues. The traditional Crossbow Festival also takes place in May, featuring a competition between crossbow teams and a costumed procession through town. Gubbio celebrates truffles, a delicacy throughout Umbria, with its White Truffle Fair in late October and early November. During the festival, white truffles are available for sampling, as well as other local products including olive oil, cheeses, and meats. Spoleto is most famous for its annual Festival of Two Worlds in July. This nearly month-long event features all aspects of the arts, with concerts, opera, dance performances, films, and theater, and draws visitors from around the world. In addition to the festival, there are several attractions of note in Spoleto. The Ponte delle Torri, a 14th-century bridge, is a good spot for panoramic views of the lush green area around Spoleto. German writer Goethe dedicated one page of his Viaggio in Italia to the bridge. The main cathedral (duomo) in Spoleto is an impressive sight. Constructed in the Roman style, the interior is home to a cycle of frescos by Filippo Lippi, as well as the artist’s tomb. These six towns are only a sampling, but they highlight the best of Umbria. 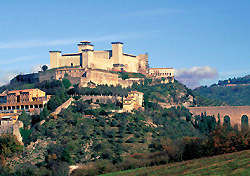 For more information on Umbria’s other towns, visit BellaUmbria.net. Southern Umbria is a two-hour drive from Rome, although it is also possible to fly into Milan and connect on a regional flight to Perugia’s small airport. The best way to explore the region is by rental car. A car allows the freedom to navigate Umbria’s winding mountain roads at any pace, as well as the possibility of staying in an apartment, B&B, farmhouse, or villa in the countryside. If renting a car is not possible, train service is available to some of Umbria’s major towns, including Perugia, Assisi, and Orvieto, and most of the bigger villages have hotels near the center of town. In Perugia, the Brufani Palace, Locando Della Posta, and Sangallo Palace hotels are highly recommended on TripAdvisor.com, while Hotel Berti, Hotel Sole, and Hotel Umbra are popular Assisi options. For more hotel reviews, visit TripAdvisor’s Umbria page. Weather-wise, the best times to explore Umbria are in May and June, and September and October. Temperatures remain pleasant in the 60s and 70s with sunny blue skies. Summertime brings hotter weather, and along with it a handful of notable events (and more visitors). In winter, temperatures drop sharply, and with the colder weather come rain and snow, as well as some store closures.